With E3 2018 consuming a lot of my video game attention, the full review of Moonlighter wont be available for another couple days or so, but I wanted to share my experience with the game so far. So far, Moonlighter is a difficult game to recommend or not recommend because there is a lot I like about it, but also a lot I don’t. 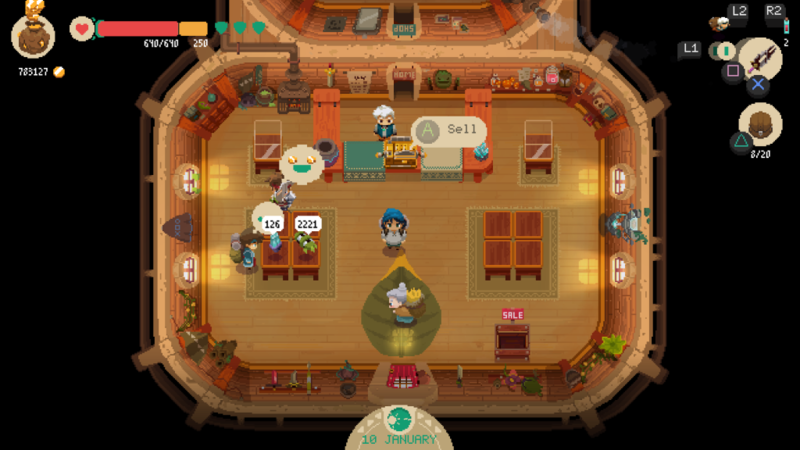 This was a very anticipated game for me, but I am finding the combat a bit stale and working the shop a bit tedious, yet I still think Moonlighter is the best in the tiny “weapon shop” genre. The game has a wide array of items, but the upgrade feeling feels sort of formulaic and mechanical, to the point that it isn’t always that fun. The shop upgrades are interesting, but the upgrades seem like a crawl and possibly skippable? I was able to get far in the game without realizing I should upgrade my shop to the next level. The weapon upgrades seem overwhelming, but concentration on a few specific lines makes the experience more efficient. Inventory management will probably turn off a lot of people, but I’m somewhat ok with it, because it separates the game from other inventory games and forces the player to make a choice. Games like Diablo and Diablo 2 don’t even have an inventory system this complex. Graphically, the game has well put together pixels and the soundtrack is also amazing. The controls are somewhat tight, but they are still pretty good enough. This is my Review in Progress for Moonlighter. The full review will posted in the next couple days or so.